A decade ago, the idea of pay-per-click advertising upended traditional approaches to lead generation. The response to an ad became something you could measure directly on the web. Today, everything is changing again. Thanks to new communications technologies, call tracking is becoming available to any business. The value of any form of advertising, whether it's a billboard, a radio spot or a TV ad, can now be calculated. The new approach makes it possible for publishers in general and directory owners in particular to be fairly compensated for the value of truly great leads. This whitepaper features industry innovators who describe what works in the new world of pay-per-call, performance-based and mobile advertising. 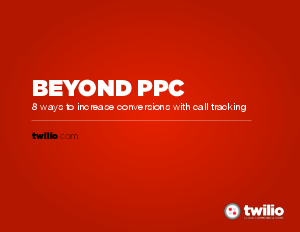 They lay out the best practices for call tracking that can help you increase the value of your web leads by an order of magnitude.